JD Suzuki Kiitsu (1796-1858) was born in Edo (today's Tokyo) and was a student of the renowned Rinpa painter Sakai Hoitsu (1761-1828). The Rinpa school is characterized by the use of flat bold colors, puddled ink (tarashikomi) and the preference for subjects such as flowers of the four seasons and literary themes. Considered one of the purely Japanese painting styles, Rinpa took its inspiration form Yamato-e (literally Japanese painting), a painting style which originated during the Heian (794-1185) period at a time when purely Japanese aesthetics flourished. The Rinpa school was originated by Tawaraya Sotatsu (fl. 1600-1640) and Hon'ami Koetsu (1558-1637). These two artists are remembered for their collaborative works as well as for their individual talents. The main artists of this school chose to paint primarily through direct observation of the works rather than from direct schooling by the master, as was usual for most artists from other schools. Suzuki Kiitsu constitutes somewhat of an exception since he worked by the side of Sakai Hoitsu for several years, often strongly influenced by the master, and only later in his career specifically working in his own style. 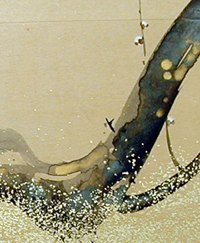 It was around 1840 that Kiitsu seemed to have found a more distinctive, personal and unique style of his own that still spoke of his tradition while displaying his more modern and bold sensibility. 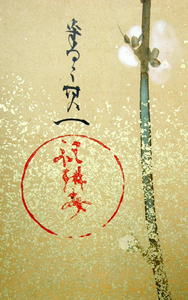 The tea screen, illustrating a branch of a plum tree, incorporates the most classical and elegant Rinpa tradition with Kiitsu's unique modern aesthetics presenting an incredibly clean and stark image of grace, elegance and bold beauty of the flower that each year announces the arrival of spring. In 1994 Takeuchi Misako suggested a possible interpretation of the chronology of Kiitsus seal (Takeuchi, Misako. Toughts on Kiitsus Signature Chronology, in Rimpa Tokubetsu ten: bi no keisho, Sotatsu, Korin, Hoitsu, Kiitsu (Rinpa special exhibition: succession of beauty, Sotatsu, Korin, Hoitsu, Kiitsu ), Nagoya-shi hakubutsukan. Nagoya: Nagoya-shi hakubutsukan, 1994, pp. 29-35. Following the guidelines provided by Takeuchi Misako and thorough direct comparison with other known works by the artist the seal on this tea screen and the modern style of the work put the work in the mature phase of the artist, around 1840 upto his death.